You can take another £30 off this price with NUSAUG11 & 3% topcash as well! Sorry about the pic. It's the best I can get from the site. Any chance of someone improving it? Here's the link to the TDF post for comparison. I bought a second hand one of Ebay a year ago. Good components for the price and an OK ride. I have since realised that it is a little heavy since I bought a carbon framed bike but for the money it is still a good bike. I will be keeping my Virtuoso for my winter rides. Sorry about the pic. It's the best I can get from the site. Any chance of … Sorry about the pic. It's the best I can get from the site. Any chance of someone improving it? Regarding the weight difference between this and the tdf. Carrying a water bottle will eliminate the advantage also compared to the average weight of a rider I dont think 400g will make much difference. If you can be bothered check out second hand ones on ebay or gumtree etc. You can get a lot more for you money. 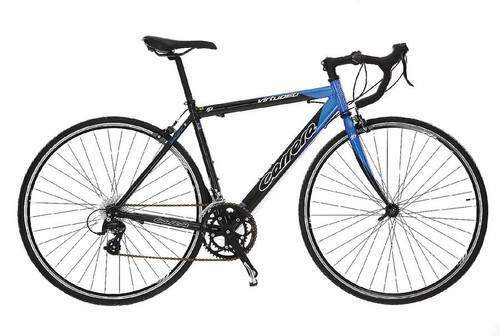 I just bought a carrera vanquish for 230 ish, this comes with a tiagra groupset and carbon forks. Might be worth going to a bike shop to find out what frame size is best for you first. had a virtuoso reserved from the weekend with Brixton halfords end of season -20% (so 231!) : a 'large' turned out to be a 20" / 50cm frame which is too small for me. Will speak to them tomorrow but looks like that deal's gone for me. Had reserved a Vanquish at Balham to try but got a call to say the bike was damaged - no others available throughout London. Seeing the bike this evening it looked ok at best : frame alright, brakes cheap, gears cheap, rear wheel looked very slightly off true (rubbing on brake) but probably worth the money.